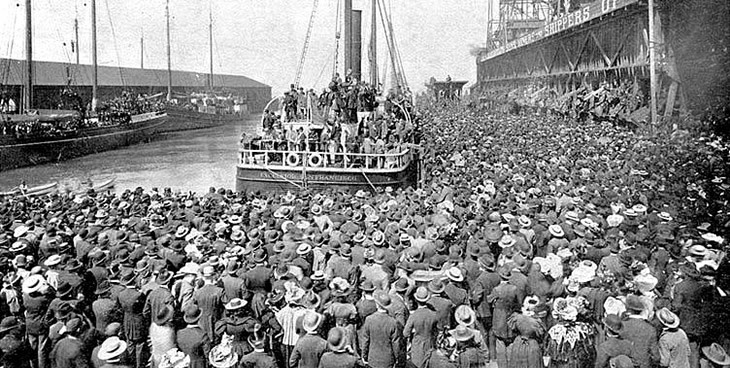 The Klondike Gold Rush of 1898 was an incredible event in Alaska’s history for many reasons. Adventurers from around the world set out for the new gold fields. 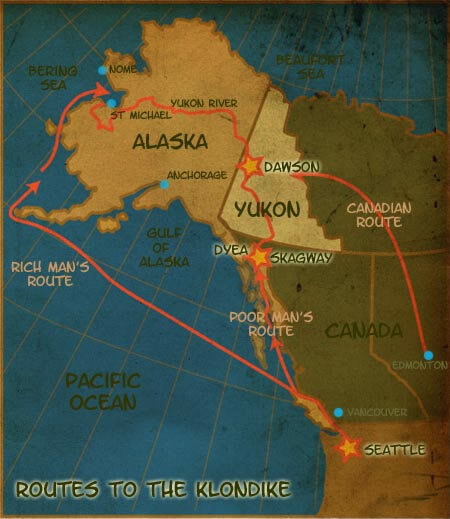 It really put Alaska on the map with wild tales told by newspapers in Seattle that sensationalized every story about the Chilkoot Trail and the enormous gold claims. It has been estimated that over a billion dollars worth of gold was found, adjusted to 20th century standards. Citizens from all walks of life, and throughout the country, quit their jobs on the spot and left for the frozen Klondike. The world had never seen a stampede like this before. The Klondike Gold Rush sparked a migration by an estimated 100,000 prospectors (although only about 40,000 actually made it.) These woefully unprepared souls trekked through the Klondike region of north-western Canada with dreams of a quick fortune dancing in their heads. Many of them died along the way suffering from malnutrition or from the dangers of the treacherous trip. There were murders and suicides, and death from hypothermia, avalanche, and, some said heartbreak. Many more were taken advantage of by the scammers that worked the trail. For the few stampeders who made it after the news of the gold strike, they found out that all the creeks had been claimed and they ended up working for others that had claims. From the UW Digital Archives: In August 1896 when Skookum Jim Mason, Dawson Charlie and George Washington Carmack found gold in a tributary of the Klondike River in Canada’s Yukon Territory, they had no idea they they would set off one of the greatest gold rushes in history. 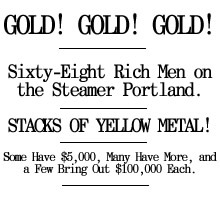 Beginning in 1897, an army of hopeful goldseekers, unaware that most of the good Klondike claims were already staked, boarded ships and Seattle and other Pacific port cities and headed north toward the vision of riches to be had for the taking. All through the summer and on into the winter of 1897-98, stampeders poured into the newly created Alaskan tent and shack towns of Skagway and Dyea – the jumping off points for the 600-mile trek to the goldfields. Skagway, at the head of the White Pass Trail, was founded by a former steamboat captain named William Moore. His small homestead was inundated with some 10,000 transient residents struggling to get their required year’s worth of gear and supplies over the Coast Range and down the Yukon River headwaters at lakes Lindeman and Bennett. Dyea, three miles away at the head of Taiya Inlet, experienced the same frantic boomtown activity as goldseekers poured ashore and picked their way up the Chilkoot Trail into Canada. 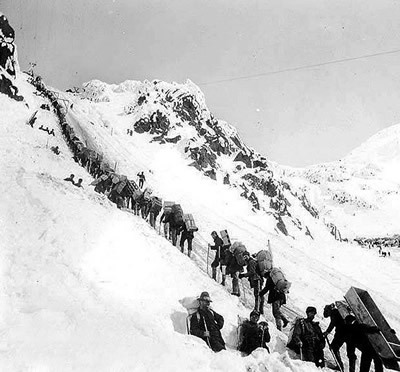 Stampeders faced their greatest hardships on the Chilkoot Trail out of Dyea and the White Pass Trail out of Skagway. There were murders and suicides, disease and malnutrition, and death from hypothermia, avalanche, and, some said heartbreak. 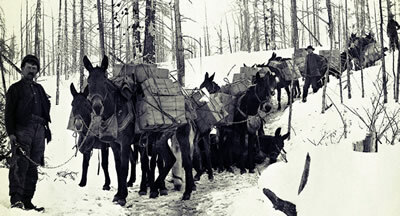 The Chilkoot was the toughest on men because pack animals could not be used easily on the steep slopes leading to the pass. Until tramways were built late in 1897 and early 1898, the stampeders had to carry everything on their backs. The White Pass Trail was the animal-killer, as anxious prospectors overloaded and beat their pack animals and forced them over the rocky terrain until they dropped. More than 3,000 animals died on this trail; many of their bones still lie at the bottom on Dead Horse Gulch. During the first year of the rush an estimated 20,000 to 30,000 goldseekers spent an average of three months packing their outfits up the trails and over the passes to the lakes. The distance from tidewater to the lakes was only about 35 miles, but each individual trudged hundreds of miles back and forth along the trails, moving gear from cache to cache. Once the prospectors had hauled their full array of gear to the lakes, they built or bought boats to float the remaining 560 or so miles downriver to Dawson City and the Klondike mining district where an almost limitless supply of gold nuggets was said to lie. By midsummer of 1898 there were 18,000 people at Dawson, with more than 5,000 working the diggings. By August many of the stampeders had started for home, most of them broke. The next year saw a still larger exodus of miners when gold was discovered at Nome, Alaska. The great Klondike Gold Rush ended as suddenly as it had begun. Towns such as Dawson City and Skagway began to declines. Others, including Dyea, disappeared altogether, leaving only memories of what many consider to be the last grand adventure of the 19th century. Want to visit the Klondike area? Depart the Skagway waterfront and immediately enter the lush wilderness of the Tongass National Forest with an experienced Alaska bush pilot. Whether you want to land on a mountain lake, fly over fjords, view glaciers and wildlife or just enjoy the phenomenal and breathtaking beauty of the last frontier. Skagway is located 90 miles northeast of Juneau at the northernmost end of Lynn Canal, at the head of Taiya Inlet. It lies 108 road miles south of Whitehorse, just west of the Canadian border at British Columbia. Skagway is accessible via ferry, automobile or plane. If driving, the Alaska Highway connects to the Klondike Highway. To arrive by water, the Alaska’s Marine Highway System services the Skagway area. Juneau is the primary domestic air entry point for Southeast Alaska. Skagway is also accessible from Haines or Juneau via the Haines-Skagway Water Taxi and the Chilkat Cruises fast ferry. Flights – After arriving in Juneau on Alaska Airlines, daily scheduled flights to Skagway are provided by Skagway Air Service, and Wings of Alaska. Skagway is a full service community with a range of accommodations, eateries, rental facilities for both vehicles and outdoor equipment, and medical and emergency facilities. Check out Skagway’s website for more accommodations.